combined bottom up/top down approach. We have discussed how to introduce an initiative which focuses on improving the organization in terms of value delivery. We have also discussed how to mind map the organization to find troubles, constraints and a true picture of your company. Once your problems have been identified it can be easy to try to simply "fix" the problem. What I mean is that human tendency is to correct what we think is the biggest perceived symptom. Approaches of this nature commonly lacks greater vision and likely only moves the problems or defers to another bottleneck. When this shortsighted plan just defers to the next constraint the whole effort is often construed as a failure. What must be considered when facing organizational change is the value stream as a whole. Understand as many constraints or non-value added activities as possible when mapping the stream. 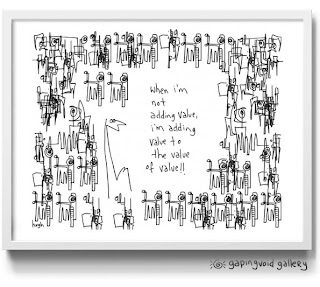 In all my consulting experience I have never seen an organization who begins a value stream map exceeding 6% of value added activity. Setting expectations with leaders from the start to have patience is a key to organizational improvement. I was working with a development team who believed they needed to hire more developers because it was taking six months to get code released (forget agile for the moment)to production. This was their problem statement (and their perceived solution). After creating a value stream map of the development cycle we learned that the cycle time was almost 900 working hours. Four hours of that time was spent developing. Roughly 80% of that time was wait time. Had the team hired more developers they could have attempted to double their productivity and take two hours out of their total cycle time. Wow what an expensive solution. Or they could have eliminated several management meetings which were simply rubber stamp approvals to move forward. Reducing the meetings took 300 hours off of the total cycle time, and it cost nothing to implement. To get that efficiency gain by hiring developers is simply impossible yet this is most commonly the first solution to reduce development value stream times. The concept of value stream mapping has been written very extensively and while there are many good posts most simply introduce the concept but fail at plugging the concept in to something actionable. 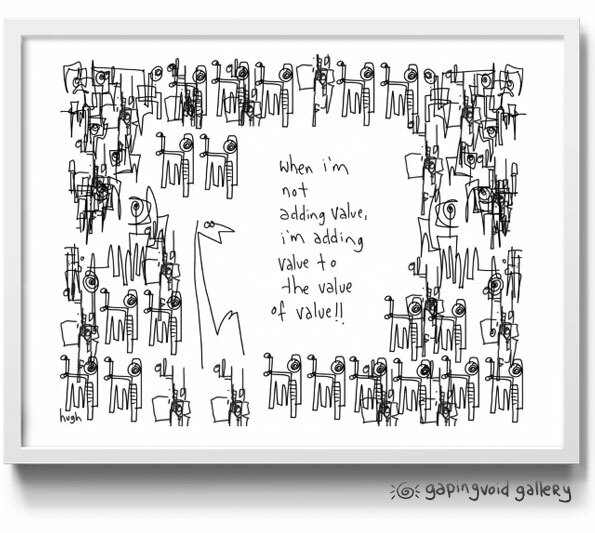 Or they prescribe perfect ways to change your value stream without providing a lesson on why focusing on the value stream is relevant. I will refer to many smarter practitioners through this blog but it's important to define what value stream mapping can accomplish in terms of starting organizational change. The LSS Academy has put it best at defining a value stream as "A value stream can be defined as all the steps – both value added and non value added – required to take a product or service from its raw materials state into the waiting arms of a happy customer." Again the concept of value in this scenario is simply what your customer is willing to pay for. We know that there are Value Added (VA) activities which the customer finds worth to pay for. Non-Value Added (NVA) activities are usually where great debate begins. This work is often very overwhelming and it's not a bad idea to look for an outside consultant to help you. This is really the only time where I encourage going outside to make this success. Consider your own organization, you are likely structured in the form of departments which scale and report vertically. Who is responsible for the product from inception to cash? A value stream is the horizontal flow of your product from that inception to cash. This will feel odd to your organization because they rarely care about their products in that manner. The best analogy is to compare the value stream to a story. A product begins its journey in marketing and end in accounts payable. The key to creating an excellent current state VSM is to document what you actually see with your own eyes. We are not interested in how the process is supposed to work, or was designed to work. Instead, we are interested in how the process is performing today. Will the process change a bit tomorrow? Sure. But that’s OK. In fact it's encouraged. There a many different ways to create a value stream map and my personal opinion is that you use one that works for you. As long as the result of the exercise is to identify your waste or NVA activities in your stream. Below is a good example I found from ASQ on a simple value stream map. Now lets get started. The teams created for the prior steps in this journey should also be used to value stream map. They will understand the mapping and problems in the organization best and it's encouraged you stick with those team members. They are likely the only people who have ever looked at the organization horizontally versus vertically. For example I once worked with a large insurance organization who were structured in to operating companies. No big surprise there but each OP Co. was designed to support certain business segments (home insurance, life insurance, investments). Within each segment we also saw turf wars where they hesitated in helping other departments. Activities as easy as sharing customer information or transferring phone calls from the customer were almost impossible to accomplish. Where's the value in this line of thinking? Well it's easy to keep that mind set when you only look within you own department. Encourage your people to think across the value stream and you will see very different outcomes. 1. Draw the current state value stream map with all of the steps, delays, and information flows required to deliver the target service. IF you're interested in some templates please contact me. 2. Assess the current state value stream map in terms of flow and waste. Collect all missing data (e.g., value added, cycle time, etc.). 3. Calculate the total lead time and value added time.4. Identify and list all areas of waste (e.g., inventory, transportation, etc.). 5. Develop a list of opportunities for improvement based on these observations. Below is a great example of mind mapping a development process (From the blog Wide Awake Developers, http://www.michaelnygard.com/). This can show a good example of how Agile and Lean can fit together in the IT world. Think of an agile activity as something which could exists more at an execution level in each activity while the Lean Value Stream focuses on the end to end process. I’m going to use the prescribed method from the LSS Academy below. Now this has a manufacturing focus but can easily be replaced with services or code. Walk the process front to back. Quickly walk the process with your team in order to understand the general flow. It’s important to also define the start and stop point of the process. Don’t attempt to take on too much. Remember, we eat an elephant one bite at a time. Draw in the customer box / details. In the top right hand side of the paper we draw the little saw topped box representing our customer. Go to the end! Next, we start at the END of the process and begin drawing the map back to front. And don’t forget about that eraser. You will need it. Nominiate a scribe and have them draw the map for the team. Another trick is to ask each person on the team to map it out so you can compare and consolidate when you get back to the room. Yet another trick is to have the team divide and conquer as you send some off to map the beginning section, some to the middle, and some to the end. There are many ways to do this. Experiment and do what works best for your situation. Focus on the flow first. Focus on the flow side of things first (bottom portion of the map). This includes the process boxes and data boxes. Regarding the data boxes, if you don’t have all the data perfectly collected on the day of the mapping exercise just do the best you can. You can always assign homework to go back and validate the figures later. In fact, even if you think you have solid data, the six sigma side of me urges you to validate your measurement systems to make sure we can trust the data. If you want to get really tricky state both a measure of central tendency and dispersion. You won’t see this advice in most lean VSM books… I guarantee it! Add the Inventory/Wait Times. Once you have all the process and data boxes in, it’s time to add in inventory and/or waiting times. For inventory, we simply count the number of components in between the processes and note them under the triangle. We also want to convert these components into days’ supply. To do this, we divide the number of components by the average daily demand (which we used to calculate takt time). So, if your average daily demand is 10 components and you count 20 components of inventory in between process step A and process step B you have 2 days’ supply (20/10) in between the two processes. We will note this number on our timeline (to be added in a future step). Lastly, don’t attempt to map every part number! Choose one or two key components to start with. You can always add more to the map later. In our example, we chose to simply count two components of bread as one subassembly since they move together down the production line. Also, we are not accounting for the peanut butter and jelly “raw material” at this point since KB&R’s expert supply chain team negotiated a killer consignment stock deal with Sam’s Club so this inventory is quite low on the line. During the study, we learned that, as one example, there were 486 sub-assemblies (972 components of bread) in between the jelly application and packaging stations. This equates to 0.69 days’ supply (486 units / 700 daily demand). This “push” process is found in just about every mass production process known to mankind. When we see this pushing action we note it on a VSM with a dashed line through the yellow inventory symbol. Draw in the information flow. This step is what really separates a VSM from traditional process maps in my opinion. You see, in addition to learning about how material flows we also want to understand how information flows. For example, we want to know it is moves about electronically? If so, we use a lightning bolt looking arrowed line. Is it communicated manually? If so, we use a straight arrowed line. Add in the timeline. We can now add the timeline to the bottom of the value stream map. This saw tooth looking line helps us separate the value added cycle time (taken from data boxes) from the non-value added time (days’ or hours’ supply info). Prepare for the High Cost of Participation. While value steam mapping can be an effective process improvement tool, the cost to use it can be high. Like racing a top fuel dragster, value steam mapping requires the presence of highly skilled support team members who practice frequently. Because of the need for considerable detail, team members will spend hours, even days, to develop a comprehensive value steam map. Unlike drag racing, where direct costs can be measured, value stream mapping involves the risk of opportunity costs that are difficult to quantify. Simpler, more productive tools that are easier to learn might be available to make describing the current process faster and more effective. Many organizations forget to consider these opportunity costs for using value stream mapping. This take times. Remember if you looking for a quick fix you might find it here but will quickly be disappointed when the entire effort fails. This is not only a change to your process but more importantly it’s a change to your culture. People take time to change. If your leaders aren’t supporting this from the top down and in the long run then you’re just going to spin your wheels. Other Problems will appear. If you’re familiar with the Theory of Constraints then you know that anytime one bottleneck is identified and eliminated another one will appear. That bottleneck as always been there but has not been your primary constraint. Don’t be discouraged if you find a mind field of bottlenecks. It’s proof that what you’re doing is working. 1. The Lean manager eagerly embraces the role of problem solver. 2. The Lean manager realizes that no manager at a higher level can or should solve a problem at a lower level—problems can only be solved where they live, by those living with them. 3. The Lean manager believes that all problem solving is about experimentation by means of Plan-Do-Check-Act. 4. The Lean manager knows that no problem is ever solved forever. James Womack, “The mind of the Lean manager,” Lean Enterprise Institute Electronic Newsletter, July 30, 2009. My first blog post was a summary of the steps which need to be taken in order to start an enterprise transformation by briefly discussing the management components which much be in place for any transformation to begin. This second blog post was written to introduce the idea of thinking about organizations horizontally (value stream). The first steps in an enterprise transformation are slow but are very important. What is often overlooked is most organizations simply don't grasp how much help the average manager needs in learning to see the value stream or how eagerly managers embrace the mind map once they see them. Now if only every manager and every mapping team can achieve and sustain the effort to understand current state. Without a mind map (or other identifier) of the current state picture defined, your problem identification and consequent solutions will be hard to socialize. Furthermore this activity is likely the first time you or your leaders will have seen your organization in this light. It will be shocking with how large and thorough this map will be, especially considering this isn't an "organizational map". All this work has not yet provided anything which traditional change programs would be considered a "win". That's just the point, this is not a program. This is a cultural transformation which will take time between when this starts to when you will start to measure improvement. It's important at this point to be patient as this phase in the process sees the problems and must have restraint to not try to solve them as they are identified. Be patient, you will get there. 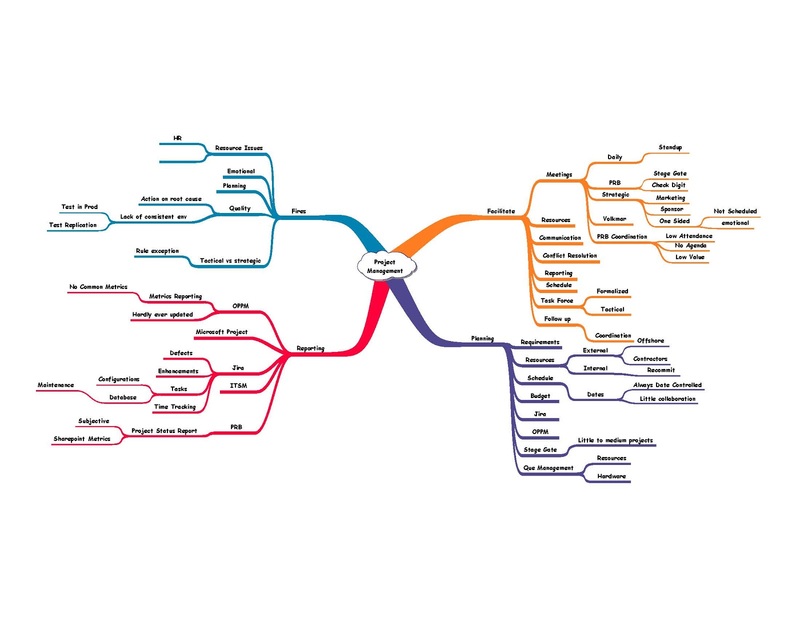 The mind map is complete, now what? Edward Deming said it right when he said most problems are because of process not people. As a result it's important not to assess blame in these exercises. There is little value in blaming others for the problems as it creates an atmosphere which does not facilitate positive results. It's a good idea at this point to continue involving members of the team who created the mind map(s). No manager at a higher level can or should solve a problem at a lower level. (And one of the worst abuses of lean tools lies in trying to do just this.) Instead, the higher-level manager can assign responsibility to a manager at a lower level to tackle the problem through a continuing dialogue, both vertically with the higher-level manager and horizontally with everyone actually touching the process causing the problem. Womack's lean law of organizational life is that problems can only be solved where they live, in conversation with the people who live with them and whose current actions are contributing to the problem. But this requires support, encouragement, and, yes, relentless pressure from the higher-level manager. This point is where different methodologies and frameworks will diverge as well. There is no right or wrong way to move forward from here. The many variables of your situation as well as what type of organization you are will dictate the most sensible path. You can use many different methods to determine the size of a problem as well. The suggestion I will give is simply one path of many that can be successful. Once a problem map has been identified you can easily insert it to the method which you find best suits your company (Theory of Constraints, BPR, TPM, Lean, Six Sigma, Agile, ETC). Create a mind map of your issues. What I mean by that is take the original mind map and create a correlating issues map. Don't stop with the first few problems you encounter. Try to make it as thorough as the mind map. This is the map where you will look at activities to improve and/or ignore. We know it's not possible to fix everything now, but with this list you will be able to quickly take issues off the map when they are resolved as well as (and this important to do) add items when they appear. Below is an example of a problem map I facilitated with a Quality Assurance (QA) group in a software development department. You will note there are no solutions or assignment of blame. Simply a map of what the problems are. Again this map will likely be a first for your company. It's not often a company has a map of their largest issues/complaints. With this map you are now prepared to take a step which can start to deliver measurable results. It's best to have your team who created this map sit on this for a couple days. Have them think over what they have come up with. Then get the group back together to discuss the problems and narrow down where to start. Take the complete map and start talking about what are the biggest issues. It's likely that the room will already have a consensus on the largest issues. When there is a consensus on what the largest problem is. Use what is known as the "5 Whys". The 5 whys is a proven method to determine how to get to the root cause of a problem. Rather then explain it myself I will borrow from a great book titled "Lean IT" by Steve Bell. "The Five Whys is the simple method of asking, “Why?” repeatedly until the root cause of a problem is uncovered. Normally the root cause is reached by the time we ask the fifth why. When the team believes it has identified a root cause, it works backward using “Therefore…” to test its logic and ensure it hasn’t missed a step in the sequence. For example, if the team investigating IT service request delays would have used the Five Whys, it might have gone as follows: Had the team performed root cause analysis, it may have discovered that there was a need for improving underlying business processes and developing standard work before considering technology-based solutions (a common theme throughout this book)." Bell, Steven C. (2012-01-04). Lean IT: Enabling and Sustaining Your Lean Transformation (Kindle Locations 4004-4010). Taylor & Francis. Once you have found what you consider to be the largest problem in the mind map and the problem if fully agreed we will now take that issue and make it our first actionable item which we will focus on for our enterprise transformation. That will be the topic of my next blog post - Value Stream Mapping. Please let me know if you have any questions. This topic is very broad and I am the first to admit there are many ways to achieve what I've explained . is plainly an agreed on visual representation for how the organization looks today. It does not define solutions or place blame. It simply is the baseline you will use to define and measure your organization transformation. The most common contention which commonly arises in enterprise transformation is what I call climbing the mountain. Intellectual Capital or IC (your employees) in most organizations have no problems identifying and defining all the inefficiencies within their organization. Complications ensue though when they are asked how to resolve those issues, or how they came to be. Additionally, much time is wasted arguing the merits of the issues when you're simply trying to identify your current state. It's even more difficult when the IC are part of the problems which they are trying to identify and can be offended with the assessment. No one likes to feel they are a liability to the organization and most IC rarely objectively realize they are. Add on the bureaucracy of pet projects or emotional commitments and it's really no surprise the failure rate of these initiatives are so high (some estimates as high as 90% according to Bill Waddell. Second, when issues are identified, how do you objectively decide what to work on without adding the complexity of everyone's flavor of the day? The flavor of the day consists of what's current in your mind as your biggest issue (which is often the most recent) facing the organization. This is rarely the largest non-value added component which needs the highest priority but is simply the one that pops in to your mind as the most recent (and likely the most important if we are being subjective). A simple example of this is defined in The Goal written by Dr. Eliyahu M. Goldratt, a business consultant whose Theory of Constraints (TOC) explains that anything not a bottleneck should not get initial focus as it will not improve your process capacity. This story though shows how easily the wrong item can be worked on and why it's so hard to identify the bottleneck or larget problem. While much of what I'm introducing was created in Lean cultures, I don't propose calling yourself Lean when you successfully implement these steps (you still have more learning to actually "Be Lean"). Introducing Lean management and information systems requires discipline, time and reflection. Lean principles are even more difficult to embrace, yet they eventually come to influence behavior throughout the enterprise. Values and principles must have time to become internalized within the unique culture of each organization and this is simply a first step. Nonetheless, it is difficult to begin with values and principles alone, because they are intangible. This is where the principles of mind mapping will help (By far the best literature on Lean in IT is Lean IT by Steve Bell and Mike Orzen. This is the most comprehensive book you will find if you're trying to start your lean journey in IT). Great, you want to begin your lean journey but where do you start? I've told you all the problems you will face but haven't yet told you how to avoid them. Where does one begin and who should be involved? This blog post can not tackle that large of a concept but I suggest several books to read to get acquainted with some best practices (A great place to start is Making Strategy Work by Lawrence G. Hrebiniak). At a very high level though your organization must tackle several components in order to launch. 1. First any change initiatives need to have top down support. This doesn't necessarily mean that upper management needs to manage the change but at a minimum they must fully support the change initiatives and be willing to change themselves. Additionally with the top down support you must fully tap your intellectual capital but I'll get to that later. 2. Create a blank slate. Do not come in to the initiative with a pre-conceived notion of what or how to change. Spend time if you need to getting people on board who can be objective and provide honest input. While being objective can be difficult, you will already have a room full of pre-conceived solutions if you do not take this step seriously. After all if you already have the solution to the problem why haven't you succeeded thus far in eliminating it? This is difficult additionally because most change initiatives within an organization are initially created because they want to solve a specific problem. In the end the original problem will be solved but TOC and mind mapping will eventually identify your root cause. If you're new to this concept or your organization is very basic on conceptualization, then start small. Perhaps, do it inside your span of control or as a personal improvement plan for your commission. It's very important that you involve all the intellectual knowledge available on the matter. If you fear this can't be done initially then narrow your first step to where you can have full access to that knowledge base. The largest disservice organizations can make is to not involve the knowledge workers and only involve management. Management certainly can participate but in today's world most intellectual knowledge is the tacit knowledge of your IC (regardless of industry I find this to be true. Peter Drucker initially saw this as early as the 1950's and it has only continued to be proven true). Getting the caveats out of the way allows us to finally talk about what is the first step. This stride can often be the most difficult because there are so many potential ways to begin (and fail). There are countless articles and books which describe how to create successful organization change and most are exceptionally good from certain frames. I find them a bit too prescriptive and often complicate something which should attempt to be simplified. Being too despotic out of the gate narrows the possibility of success when your case should need to deviate from their framework. My personal experience has proven that beginning with a mind map is a solid common method to define what previously only exists in your mind. The information you will discover in a mind map has likely never been mapped for your organization and your ability to learn from the experience is truly priceless. 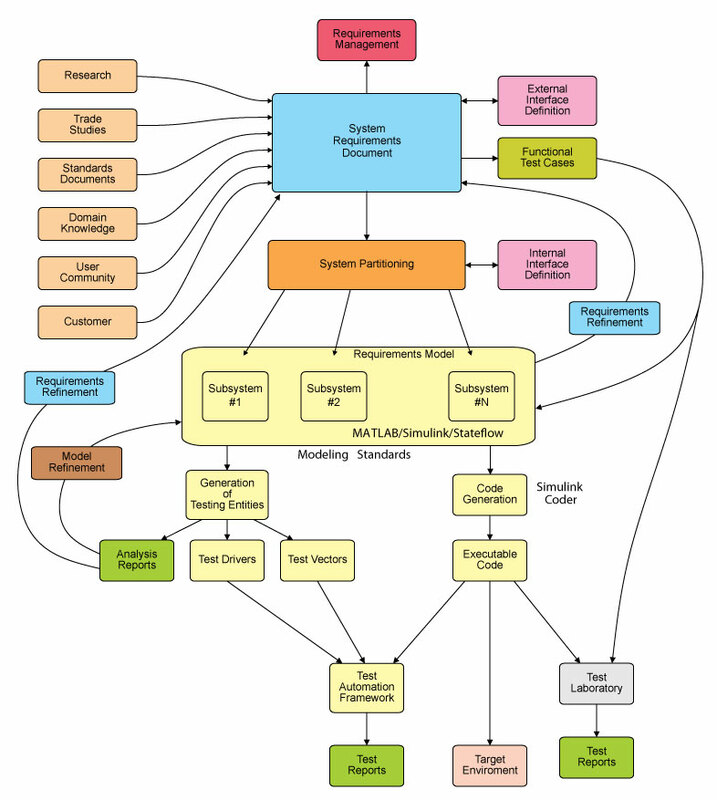 A mind map as defined by Wikipedia is "A diagram used to visually outline information. A mind map is often created around a single word or text, placed in the center, to which associated ideas, words and concepts are added. Major categories radiate from a central node, and lesser categories are sub-branches of larger branches. Categories can represent words, ideas, tasks, or other items related to a central key word or idea." Admittedly the main goal of a mind map is for the facilitation of knowledge transfer from everyone in the session around one concept. Granted it's not that easy, but the concept can range from the organization all the way down to a specific job role. This simplified approach is successful primarily because simplifies what is very difficult for people to state in a traditional strategic approach (Brain Storming, etc). 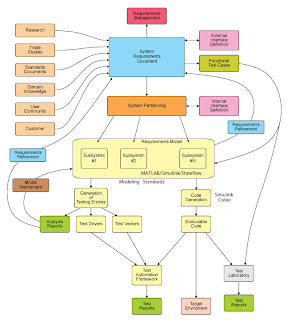 Mind mapping takes what are often considered complex relationship between organizational components and allows them to be visually simplified. This method does a great job in minimizing what Chip Health and Dan Heath defined in their book Made to Stick: Why Some Ideas Survive and Others Die as the curse of knowledge. The curse of knowledge occurs when we assume others around us have the some comprehension of concepts which we often consider second nature or back of our hand. Alas we have a hard time often explaining our jobs, product specs or protocols to those who are not inside the organization day in and out. For example, if you ever have the opportunity to listen to air traffic controllers working, you will understand what I'm talking about. Their instructions to pilots are firm and concise but if you're not educated in to their protocol you would not have any idea what they are talking about. Mind maps do a great job at minimizing the curse of knowledge by allowing a simplistic framework to state what is often "obvious" . Mapping can be done with software (I use Inspiration 9) or simply a white board or powerpoint. The map starts with a center point concept or locus. This concept is the highest level of which your initiative focuses. There can not be a higher level defined in the map. If you were to start this map with your C level executives then you would have the name in the company in the center. For example, say you're mapping for IT Project Management role in an IT department. You would place Project Management as the center section while each additional trunk off the main idea would be the major components of the Project Management role. This information is identified and facilitated on the map by the members present in the mind mapping session who are calling out the responsibilities of each trunk. 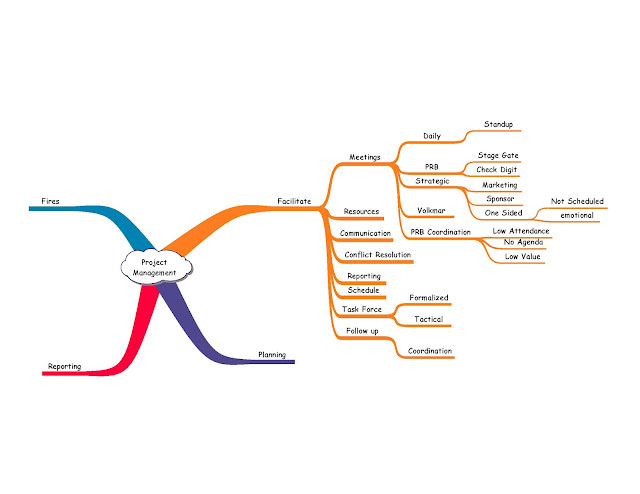 The below example is a mind map created for an IT shop I was consulting several years back. The participants were allowed to take the conversation as deep as they wanted without the worry of political fallout or conflict. Recommendation - I often do not invite managers to the meetings as they will tend to take control of the conversation. Managers tend to not want to discuss what structure really is but what they think it is. This does not facilitate an honest open session and can prohibit real improvement from occurring. If you feel management needs to be involved I would encourage setting up a mind mapping session with only managers who are peers and allow them to speak freely. Additionally I do not recommend sharing the results between groups. The best test on the delta between the two groups is to have them create their maps organically and independently of each other. The facilitator of this session can be anyone but it's generally a good idea to use someone outside the group who doesn't have the curse of knowledge regarding the inner workings of the team. Additionally it's a good idea to make sure your facilitator is just that, a facilitator and not driving the concepts. Each trunk is a large concept that generally can't not be compiled to anything larger (agileists can recognize this as an epoch). When creating your mind map I encourage you to go where the discussion goes. This may result in jumping around to different trunks but it's unliekely people will be able to identify all components of one trunk at one time. Furthermore you will start to find that people want to quickly point out the problems when discussing items. Encourage this but do not dwell on it. Quickly put it in the branch and move on. Otherwise these sessions will get bogged down in negativity. The image above shows a trunk of Project Management and their role in facilitating as part of their job responsibility. Notice that concepts have been identified and some have the problem branch associated. This is as far as it goes, the purpose of this initial assessment is to understand current state, not to prescribe solutions. This is step one for your transformation. If you want a more detailed example or have questions please feel free to contact me. I believe the power of this tool is so valuable that it should not be reserved for highly paid consultants. You should be using it daily to improve your job, department, company and life. In the next post I will show you how to identify problems or areas for improvement and how to put structure around that second step.